Millennial couples are spending an average of $31,000 on their wedding ceremony and reception. 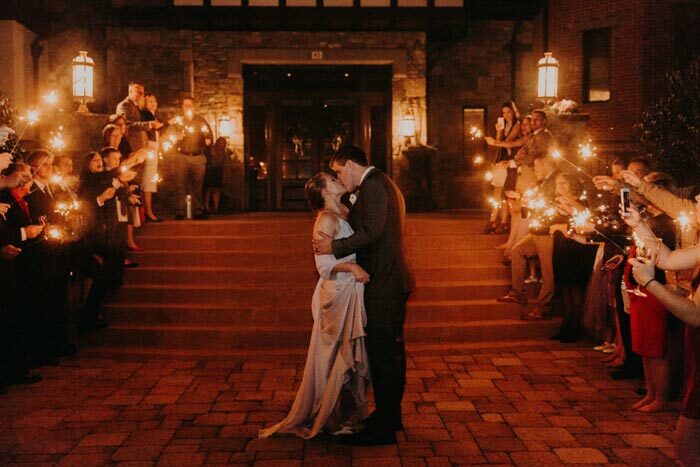 With costs in Metropolitan areas like New York and San Francisco averaging $15K more than other areas, weddings in Asheville can seem like a relative bargain. And Asheville certainly has no shortage of wedding professionals—wedding planners, photographers, caterers, etc. Which is a good thing, since most couples are hiring an average of 12 to 13 vendors to create and coordinate their ceremony. It’s not surprising that most brides feel an enormous amount of pressure to impress their guests, compete with their friends’ weddings, create “picture perfect” events and please their parents (who are often footing the bill). Even the most organized bride-to-be is often overwhelmed by the seemingly millions of decisions to be made and the management of all the moving parts. As a wedding dress designer, I’ve had the opportunity to work with many brides as they plan their special day. Here are a few suggestions for making your wedding planning process a less stressful, more fun, and memorable experience. Remember why you’re throwing this party in the first place, especially when you feel like things are going wrong or stresses are taking over. Trust that it will all come together and be a wonderful occasion, even if everything doesn’t go exactly as planned. Set priorities for the tasks on your to-do list. Rank everything by order of importance and urgency. Take care of your top priorities first. After your engagement, you’ll feel urged to book everything as soon as possible. But remember, there’s no rush. Spend quality time getting to know vendors before finalizing your decisions. You may feel like the decisions and options are endless when it comes to wedding planning. Limit your choices by staying focused on the kind of wedding you want to have. Whether it’s big or small, destination or local, choose that early on so that you know what you’re in for when you start making plans. Create an event that reflects who you are. It should match your style and vibe. Once you have a theme, color palette, or your inspiration nailed down, go with those ideas. * One of my clients came to have a consultation with a very clear idea that their wedding color will be purple. I designed Mother of the bride dress first as she knew exactly what she wanted. 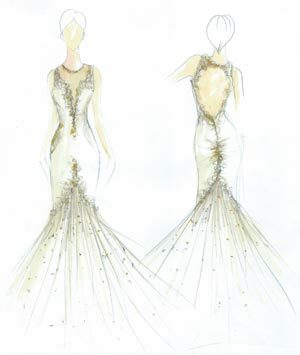 Then it was time to design the bridal gown. The bride was torn between a traditional white gown and this very unique pastel lilac colored gown that she loved so much. I draped the fabrics on the bride to show how those two colors complemented her beautiful blue eyes and strawberry blonde hair. The bride and her mother spent a good amount of time considering the options and chose the lilac silk gown. After all, they knew what they really wanted. They stuck to their original vision and everything worked out perfectly. People will tell you what you should have or do at your wedding. However if you’re not sure why you’re doing a certain “wedding tradition,” feel free to take it out of your wedding plans. Give your wedding a personal touch with any family traditions or something you want to start for future generations. It is almost impossible to ignore fashion trends when you are shopping for your wedding dress. Whether you planned to or not, you’ve already become familiar with popular wedding trends through sites like Pinterest and Wedding Wire. 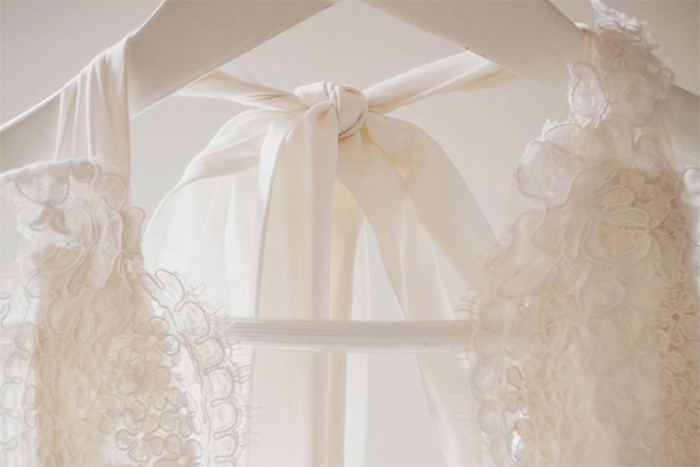 However, your wedding attire should represent your personal style. Think of the aisle as your personal runway. * One common request I get from my clients is that they want to look their best, not like some model from bridal magazines. Most women already know what neckline, sleeves, and shape of dresses look and feel good on them. One of my clients said she was not keen on laces or embellishes. Even though lace is a major 2017 wedding trend, we went for a draped silk gown with very clean lines and minimal details. She was extremely happy with the result, and said she would wear that dress again after the wedding. One of my other clients had really amazing legs and she wanted to show them off. I explained to her that a short dress will look somewhat informal compared to a full-length gown but she decided to have the skirt cut above the knees. She was very comfortable in that dress and looked amazingly beautiful. Pick a theme for the atmosphere and overall look of your wedding. Narrow down the choices of colors, flowers, deco, food, etc. Select at least 2 colors that complement each other and work well together. It is essential to find a planner, vendors, and designers who will help create and manage your vision as if it were their own. It’s not just about budgets and what you have heard about the people you work with, but also who understands you, respects your vision, and who will offer you the support you need, in addition to outstanding service. Schedule a couple of in-person sessions and conference calls with your vendors before the wedding. Be sure to go over what you expect of them thoroughly. * My business is to have the bride’s dress and the wedding party’s wardrobe ready for the big day. Most of the time, all the dresses are finished, pressed and hung nicely days before the wedding day. But sometimes there are some situations that need my attention on the wedding day, like figuring out how to tie bows, bustle the gown, urgent repairs, or even just the emotional support of ensuring them that they look impeccable for the biggest event of their lives. I extend my service to the dressing room on the wedding day to help and support my clients. Your family members and friends are so happy for you and eager to help. Involve them by having them take a look at your to-do list and pick any items that they feel they can handle for you. Exclude people who increase your stress level. The quality of the people who are there will determine the success of your wedding. Easy-to-get-along-with personalities create opportunities for your guests to get to know new people and have a great time, whether they know half of the attendees or just the bride and groom. Keep the people who know how to love and support you to create most memorable and enjoyable event of your life. Try not to save big decisions or plans for the last minute. You’ll end up spending more money than you should and also be stuck making compromises on things you shouldn’t have to compromise on. Focus on planning a wedding that’s meaningful to you instead of planning a “perfect wedding.” Help yourself feel more at ease during the wedding planning process by accepting that things may take a different turn than you expect along the way. Enjoy the time you’re spending planning your wedding and make it fun along the way. Your wedding is a celebration of love and family. So when you plan your special day, don’t forget to express joy and gratitude to your family members and the special people in your life. Make them a part of the process and share the adventure! * Due to the nature of my business, I often witness most the beautiful and emotional moments between mothers and daughters. Fitting sessions are filled with tears, laughter, stories, memories, hugs and kisses. Mothers are so proud and the “little” girls are forever grateful. One of my clients ordered a dress for her future mother-in-law to express how she feels about her. She told me, “My mother-in-law is always giving to others. She takes care of special needs adults as a day job then she takes care of grandchildren at home all the time. She never does anything for herself. She could really use a flattering dress.” So they went shopping for a new set of under garments and came to the fitting session together. Sharing that fun afternoon together is a precious memory they will never forget.